Both managers heaped praised on former Manchester United goalkeeper Paul Rachubka. If not for Paul Rachubka’s fantastic save in the dying minutes of the second half, former Kerala Blasters midfielder Kervens Belfort would have gifted Jamshedpur FC their first win in Indian Super League. But his manager Steve Coppell was happy to share the points with the hosts. “I thought we played well, (we) had moments where we could have been better- from an attacking point of view. We possibly had more shots, they certainly had more possession. Their goalkeeper made an exceptional save at the end. Overall I am really happy with what went on,” said Coppell. Though veteran midfielder Mehtab Hossain went toe-to-toe with Dimitar Berbatov all evening, the Jamshedpur FC boss said they only wanted to “harass” the Bulgarian. Coppell added that he was pleased with the performances of Memo and Gonclaves. Kerala Blasters coach Rene Muelensteen demanded improvement after another goalless draw at home. 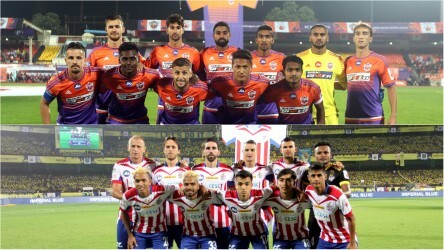 He hailed Paul Rachubka for denying Jamshedpur from taking all three points. “We need to up the speed of play, switch the play quicker, get in better areas to cross the ball earlier and create more shooting opportunities,” said Meulensteen. He is keen to ensure fans get their money’s worth and believes the first goal will increase the team’s confidence. “The fans deserve a good round of football, lots of chances and hopefully goals. When we score that first goal I am sure things will improve,” he added.